Khodabakhsh, Peyman, Mashayekhi, Samira. (1394). Looking for a New Order in Urban Energy Efficient Strategies in Urban Studies. معماری و شهرسازی آرمان شهر, 8(14), 131-143. Peyman Khodabakhsh; Samira Mashayekhi. "Looking for a New Order in Urban Energy Efficient Strategies in Urban Studies". معماری و شهرسازی آرمان شهر, 8, 14, 1394, 131-143. Khodabakhsh, Peyman, Mashayekhi, Samira. (1394). 'Looking for a New Order in Urban Energy Efficient Strategies in Urban Studies', معماری و شهرسازی آرمان شهر, 8(14), pp. 131-143. Khodabakhsh, Peyman, Mashayekhi, Samira. Looking for a New Order in Urban Energy Efficient Strategies in Urban Studies. معماری و شهرسازی آرمان شهر, 1394; 8(14): 131-143. 1Ph.D. Candidate of Urban and Regional Planning, Technical University of Berlin (TU-Berlin), Berlin, Germany. 2PhD. Candidate of Urban and Regional Planning, Technical University of Berlin (TU-Berlin), Berlin, Germany. Banister, D. (1992). Energy Use, Transport and Settlement Patterns. In Sustainable Development and Urban Form. M. J. Breheny, (ed. ), Pion Ltd., London,UK. Banister, D., Watson, S., and Wood, C. (1997). Sustainable Cities: Transport, Energy, and Urban Form. Environment and Planning B: Planning and Design, 24(1), 125–143. London, UK. Brehny, M. (1986). Centrists, Decentrists and Compromisers: Views on the Future of Urban Form. In The Compact City. A Sustainable Urban Form? (M. Jenks, E. Burton and K. Williams, eds. ), Spon Press, Chapman and Hall, London, UK. Brown, M. A., Southworth, F., and Sarzynski, A. (2008). Shrinking the Carbon Footprint of Metropolitan America. Metropolitan Policy Program, Brookings, Washington, DC. Cohen, C., Lenzen, M., and Schaeffer, R. (2005). Energy Requirements of Households in Brazil. Energy Policy, 33(4), 555–562. Dey, C., Berger, C., Foran, B., Foran, M., Joske, R., Lenzen, M., & Wood, R. (2007). An Australian Environmental Atlas: Household Environmental Pressure from Consumption. in Water, Wind, Art and Debate: How Environmental Concerns Impact on Disciplinary Research. G. Birch, (ed. ), Sydney University Press, Sydney, Australia, 280–315. Dhakal, S., Hanaki, K., Hiramatsu, A. (2003). Estimation of Heat Discharges by Residential Buildings in Tokyo. Energy Conversion and Management, 44(9), 1487–1499. Dhakal, S. (2004). Urban Energy Use and Greenhouse Gas Emissions in Asian Megacities: Policies for a Sustainable Future. (H. Imura, ed.) Institute for GlobalEnvironmental Strategies (IGES), Kitakyushu, Japan. Dhakal, S. (2009). Urban Energy Use and Carbon Emissions from Cities in China and Policy Implications. Energy Policy, 37 (11), 4208–4219. Doi, K., Kii, M., & Nakanishi, H. (2008). An Integrated Evaluation Method of Accessibility, Quality of Life, and Social Interaction. Environment and Planning B: Planning and Design, 35(6), 1098–1116. Ewing, R., Cervero, R. (2001). Travel and the Built Environment: A Synthesis. Transportation Research Record: Journal of the Transportation Research Board, 1780(1), 87–114. GEA. (2012). Global Energy Assessment – Toward a Sustainable Future. Cambridge University Press,Cambridge, UK and New York, NY, USA and theInternational Institute for Applied Systems Analysis,Laxenburg, Austria. Cambridge University Press, Cambridge, UK and New York, NY, USA and the International Institute for Applied Systems Analysis, Laxenburg, Austria, 1307-1400. Holden, E., Norland, I. T. (2005). Three Challenges for the Compact City as a Sustainable Urban Form: Household Consumption of Energy and Transport in Eight Residential Areas in the Greater Oslo Region. Urban Studies, 42(12), 2145–2166. Hu, M., Bergsdal, H., van der Voet, E., Huppes, G., and Müller, D. B. (2010). Dynamics of Urban and Rural Housing Stocks in China. Building Research & Information, 38(3), 301–317. Jenks, M., Burton, E., & Williams, K. E. (1996). The Compact City. A Sustainable Urban Form?. Spon Press,Chapman and Hall, London, UK. Kennedy, C., Steinberger, J., Gasson, B., Hansen, Y., Hillman, T., Havranek, M., Pataki, D., Phdungsilp, A., Ramaswami, A., & Mendez, G. V. (2009). Greenhouse Gas Emissions from Global Cities. Environmental Science & Technology, 43(19), 7297–7302. Kenworthy, J. R. & Newman, P. W. G. (1990). Cities and Transport Energy – Lessons from a Global Survey. Ekistics – the Problems and Science of Human Settlements, 57 (344–45), 258–268. Larivi e re, I. and Lafrance, G. (1999). Modelling the Electricity Consumption of Cities: Effect of Urban Density. Energy Economics, 21(1), 53–66. Lenzen, M., Dey. C., & Foran, B. (2004). Energy Requirements of Sydney Households. Ecological Economics, 49(3), 375–399. Lenzen, M., Wier, M., Cohen, C., Hayami, H., Pachauri, S., & Schaeffer, R. (2006). A Comparative Multivariate Analysis of Household Energy Requirements in Australia, Brazil, Denmark, India and Japan. Energy, 31(2–3), 181–207. Liu, J., Daily, G. C., Ehrlich, P. R., & Luck, G. W. (2003). Effects of Household Dynamics on Resource Consumption and Biodiversity. Nature, 421(6922), 530–533. Mayor of London. (2004). Green Light to Clean Power: The Mayor’s Energy Strategy. Greater London Authority, London, UK. Newton, P., Tucker, S., & Ambrose, M. (2000). Housing Form, Energy Use and Greenhouse Gas Emissions. In Achieving Sustainable Urban Form. (K. Williams, E. Burton and M. Jenks, eds. ), Routledge, London, UK, 74–84. Newman, P. W. G., Kenworthy, J. R. (1989). Gasoline Consumption and Cities – A Comparison of U.S. Cities with a Global Survey. Journal of the American Planning Association, 55(1), 24–37. Newman, P. W. G., Kenworthy, J. R. (1999). Sustainability and Cities: Overcoming Automobile Dependence. Island Press, Washington, DC, USA. Norman, J., MacLean, H. L., Asce, M., and Kennedy, C. A. (2006). Comparing High and Low Residential Density: Life-Cycle Analysis of Energy Use and Greenhouse Gas Emissions. 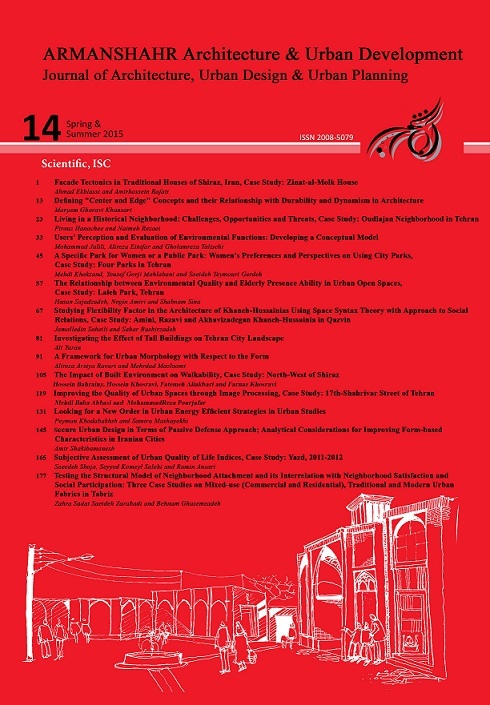 Journal of Urban Planning and Development, 132(1), 10–21. National Academy of Sciences, 107(41), 17521–17526. Pachauri, S., Spreng, D. (2002). Direct and Indirect Energy Requirements of Households in India. Energy Policy, 30(6), 511–523. Pachauri, S. (2004). An Analysis of Cross-sectional Variations in Total Household Energy Requirements in India Using Micro Survey Data. Energy Policy, 32(15), 1723–1735. Peseke. B., Roscheck. A. (2010). Der Weg In Die Zukunft - Energetische Stadtplanung Am Beispiel Des Ehemaligen Straßenbahndepots An Der Heinrich-Mann- Allee In Potsdam. Universitätsverlag der TechnischenUniversität Berlin. Berlin. Bose, R. K. (2010). Energy Efficient Cities: Assessment Tools and Benchmarking Practices. EnergySector Management Assistance Programme, World Bank,World Bank Publications. Ratti, C., Baker, N., & Steemers, K. (2005). Energy Consumption and Urban Texture, Energy and Buildings. 37(7), 762–776. Rickaby, P. A. (1991). Energy and Urban Development in an Archetypal English Town. Environment and Planning B: Planning and Design, 18(2), 153-175. Salat, S. and Mertorol, A. (2006). Factor 20: A Multiplying Method for Dividing by 20 the Carbon Energy Footprint of Cities: The Urban Morphology Factor. Urban Morphologies Laboratory, CSTB (FrenchScientific Centre for Building Research) and ENSMP (EcoleNationaleSuperieure des Mines de Paris), Paris,France. Salat, S. and Guesne, C. (2008). Energy and Carbon Efficiency of Urban Morphologies. The Case of Paris. Urban Morphologies Laboratory, CSTB (FrenchScientific Centre for Building Research and ENSMP(Ecole Nationale Superieure des Mines de Paris), Paris,France. Schipper, L. (2004). International Comparisons of Energy End Use: Benefits and Risks. In Encyclopedia ofEnergy. C. J. Cleveland, (ed. ), Elsevier, Amsterdam, theNetherlands, 3, 529–555. Schulz, N. B. (2010a). Urban Energy Consumption Database and Estimations of Urban Energy Intensities. International Institute for Applied Systems Analysis(IIASA), Laxenburg, Austria. Vringer, K. Blok, K. (1995). The Direct and Indirect Energy Requirements of Households in the Netherlands. Energy Policy, 23(10), 893–910. Vivier, J. (2006). Mobility in Cities Database, Better Mobility for People Worldwide, Analysis and Recommendations. International Association of PublicTransport (UITP), Brussels, Belgium. Household Carbon Footprint. Ecological Economics, 66(2–3), 379–391. Wier, M., Lenzen, M., Munksgaard, J., and Smed, S. (2001). Effects of Household Consumption Patterns on CO2 Requirements. Economic Systems Research, 13, 259–274.